A collaborative study by the University of Basque Country and the University of Nottingham has managed to identify the structural damage to the brain by chronic excessive alcohol use. The study is the first of its kind and details the damage at the molecular level. The structural damage is in the areas associated with executive functioning such as planning, strategic thinking, working memory, selective attention and control of behavior or impulse control. The research was published in the PLOS ONE journal and points conclusively to structural damage in the prefrontal area of the brain. The study consisted of analyzing the postmortem brains of 20 people previously diagnosed with alcohol abuse/dependence and 20 non-alcoholic brains. The specific regions affected include the α- and β-tubulin and the β II spectrin proteins, which significantly altered the neuronal structure in the brain of acoholic patients. Optical microscopy revealed that the neurons in the prefrontal regions of the brains of the alcoholic patients had undergone alterations compared to those of non-alcoholic patients. Next the researchers used proteomic techniques in order to identify which specific proteins were modified in these neurons. Tubulins are globular proteins, whereas spectrins are responsible for maintaining the cell shape. In order to quantify the amount of protein in each brain sample the Western Blot technique was used, and determined that the level of protein was reduced as a consequence of the damage produced by ethanol. Mass spectrometry, identified the exact nature of the proteins affected and confirmed that within the tubulin protein family there was a reduction in the α and β proteins; while among the spectrins, there was a decrease in the β II protein. A previous study had detected changes in executive function in living alcoholic individuals who were subjected to a series of testing to measure their cognitive skills. The results of the study will be published in July 2014, in the online issue of Alcoholism, and analyzed the impact on three networks involved in brain functioning: altering, orienting and executive control. Deficits in executive control were severely pronounced. In this study 30 sober and detoxified alcohol dependent individuals were recruited as well as 30 individuals who drank lightly. The subjects were matched for age, gender and education. The research participants completed the Attention Network Test designed to examine changes related to the three intentional network described above. The alcohol dependent individuals had substantial difficulties resolving task conflicts and the deficits were found at the higher level of attentional network called executive control, specifically, executive functions and frontal lobe functioning. The deficits were related to the direct effects of the duration and intensity of AD on the frontal regions of the brain. 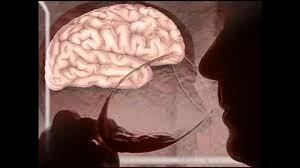 “Excessive drinking has a negative impact on brain structure and functioning, leading to neuronal loss and impaired functioning of several brain areas, particularly the frontal lobe or the anterior part of the brain, that is the prefrontal and frontal areas,” said Pierre Maurage, a professor at the Université catholique de Louvain as well as corresponding author for the study. The researchers recommend that therapeutic programs should be used to rehabilitate specifically impaired abilities, improving executive control and reducing the risk of relapse. ← Processed red meat increases risk of heart disease in men.